Society of Automotive Engineers India (SAEINDIA) is India’s leading resource for mobility technology. As an individual, member-driven, society of mobility practitioners, the ownership of SAEINDIA rests with its members who are individuals from the mobility community, which includes Engineers, Executives from Industry, Government Officials, Academicians and Students. Collegiate club of SAEINDIA aims in enhancing the specialized abilities of its student members to advance in research, development, design, manufacture and utilization of vehicles which operate on land, water, air and space. Knowledge Round Table (KRT) club is a group of SAE professional members of automobile fraternity and academic institutions working as a group to conduct activities within their organization. This mainly focuses to create a learning culture across professionals through professionals, learning the various activities of SAEINDIA Southern Section and identifying various opportunities for continuous growth of individual and organization. 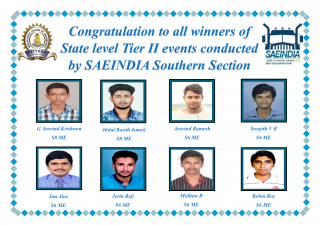 SAEINDIA SBCE Collegiate club was formed on November 2017 with 101 student members in association with SAEINDIA Southern section, SAEINDIA Cochin Division and Department of Mechanical Engineering. Inauguration of SAEINDIA SBCE Collegiate club AND KRT club was organized by the Department of Mechanical Engineering. 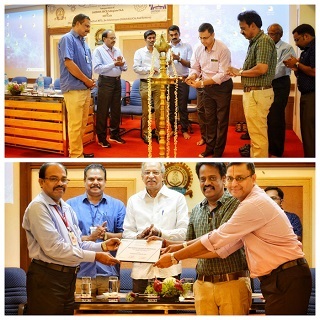 Shri B Sreenivasan (General Manager, R&D, UCAL fuel systems) inaugurated the collegiate club. Dr.E.Rajasekar, Secretary, SAEINDIA, Southern section inaugurated the KRT club. Prof. Anilkumar A V, HoD gave the welcome note, Shri K K Sivadasan, Treasurer, SBCE presided the function and Dr. Sreejith Mohan presented a report on the club. Dr. Suresh Babu, Principal, SBCE, Prof.Francis Augustine, Chairman, SAEINDIA Cochin Division and Assistant Professor Vaisakh.Y fecilitated the function. Student chairman Christy Reenu gave the vote of thanks. 1. Bharath Stage VI Emission norms. 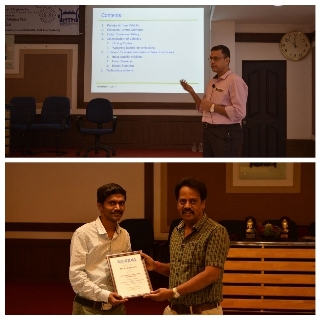 Shri B Sreenivasan (General Manager, R&D, UCAL fuel systems) discussed about the pollutants in the exhaust gas of two wheelers that cause pollution and the emission norms. Among that one reflecting point come out is the induction of Bharat Stage VI engines in India in 2020. The most important problem we are facing nowadays is the pollution from vehicles due to emission of various gases such as CO, HC and NOx. So in order to reduce the emissions automotive sector must focus on making engines with less pollutant. For that research and experimentation are now going live to reach the task of making BS VI in 2020 as per the governments initiative. BS VI is a best solution to control emissions from vehicles because it produces only 1 kg/km of CO, 0.10 kg/km of Hydrocarbons, 0.06 NOx and .068 of NMHC rather than 1.403 kg/km of CO, 0.79 Hydrocarbon, and 0.39 NOx in BS IV. Dr.E.Rajasekar, Secretary, SAEINDIA discussed about the importance of Green fuels such as electricity, ethanol, methanol, natural gas and hydrogen. Comparing each fuel and its efficiency only hydrogen (67.7% efficient) can give a best solution to replace petroleum fuels (83.3%). Hydrogen gas is non polluting, renewable and cheaper in near future but its storage and low power production is a big challenge to achieve. Electric vehicle is a good option but replacement of battery is a big trouble due to high cost. Finally Dr Rajasekar implied that complete replacement of IC engine is not possible, only we can do is apply replacement in possible sector. Every year SAEINDIA Southern Section Conducts Student Convention. As a part of Student Convention 2018 Tier -1 Competition were conducted by SAEINIDA Sree Buddha collegiate club in Association with Department of Mechanical Engineering. Out of 35 competitions proposed by SAEISS, 10 of them were conducted at Sree Buddha. The students who got first and second positions participated in Tier -2 events, which was held at Saintgits College of Engineering, Kottayam. 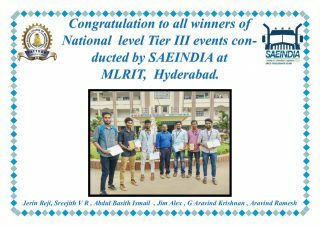 The tier-3 events were conducted at MLR Institute of Technology, Hyderabad. Six of our students got various prizes in the national level.